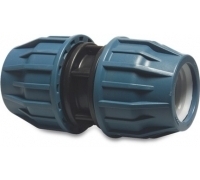 Our extensive range of Jason compression fittings have been long established with professionals within the drinking water industry. Fully WRAS approved and available in sizes 16mm - 110mm, our compression fittings provide a quick and effective solution to joining MDPE & HDPE water pipe. With a maximum working pressure of 16 Bar and suitable for use within the Utility, Renewable and Farming industries we offer a competitive alternative to notable brands such as Philmac, Plasson and Polyfast.